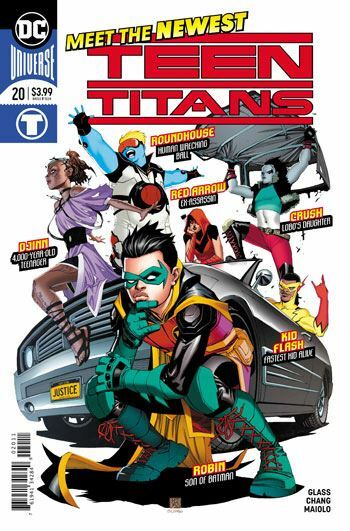 Last issue gave us the introduction to the main heroes of the new line up, and we got to see how Robin, Kid Flash and Red Arrow had all taken a darker turn in their lives. The latest issue introduces us to the new members of the team: Roundhouse, Djinn and Crush. They are an interesting lot, well chosen to contrast with the other heroes. 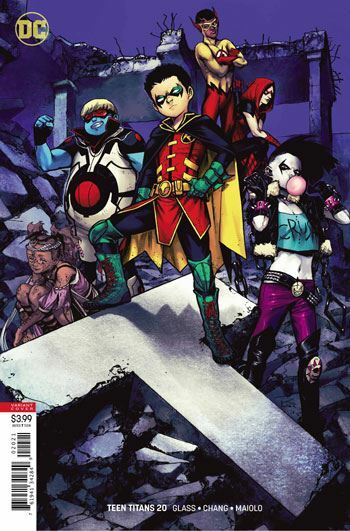 The story is told in flashbacks, interspersed while the newly formed Teen Titans take on Brother Blood. I really enjoy how the tale was formatted, with pages dedicated to each of the players, and the flashbacks coloured slightly differently to make clear the jump in time. Djinn is reminiscent of Raven, in both her mystical nature, and the fact that there is clearly going to be some major backstory unfolding with her. Unlike Raven, she is one of the more open and personable members on this highly dysfunctional team. Crush is a daughter of Lobo, and is pretty much exactly what one would expect from that kind of character. That is totally fine by me. In a way she reminds me of L’il Lobo, from Young Justice, and adds both some heavy muscle to the group, as well as some bizarre comedy. But to my surprise I found Roundhouse the most endearing of the new members, even though we don’t find out much about him in this issue. Kid Flash insisted upon Roundhouse being admitted to the group, and I am sure there is some backstory coming to explain their connection. Damien reluctantly agreed, but has plans to dispose of the young man as soon as possible. Perhaps it is simply being on Damien’s hit list that makes me root for him. The story is tightly told, and the art is energetic and fun. But there is no mistaking that this is continuing a dark tone, as the last couple of pages shockingly reveal.